(4) falling prices further increase the downward pressure on interest rates. to see the destructive nature of open market operations. sell. On rare occasions the Fed would be a seller. This is their signal to buy. wider the spread and the greater the bond speculators’ profits will be. I have probably missed something. If the fed buys 10 year bonds. Say $100 worth. Let's say there is a fractional reserve requirement of 10%, that creates $1000 dollars of cash in the economy. the Money supply rises and so do prices. higher inflation will make longer term bonds less attractive, which would mean as soon as the Fed stops buying bonds the price will fall significantly. and the bonds were bought with cash that isnt lent in the first place. the commercial banking system confers a velocity of about 12-14X upon base money. The velocity of gilts (and presumably US treasuries are the same or higher) is about 8. However that velocity of 8 actually supports more lending on top of that, so who knows how high the final velocity of govbond related circulation is. I would guess higher than 8 but somewhat less than 12. That means government bonds are almost as money-like as base money. Base money is levered up by normal bank-consumer lending by commercial banks and gilts are levered up by the wholesale funding market and the shadow banknig sector. I was trying to find a chart that would demonstrate government bond velocity (here velocity is simply, trading volume) rising strongly after the closure of the gold window and the establishment of electronic trading. Unfortunately I can't find any data prior to 1990.
your second point is that it is just new money created, so even if no one borrows, does the money supply still go up? did you read the money illusion thread yet? So this must assume no bank lending? so government bonds are being fractionally reserved? so for each bond issued say at $100, you are saying a final circulation of $800? - how does that work? not yet - will do. well, it would work, but, as you can see from the graph above, from the ticker forum, borrowing is reducing...therefore, a bank may have cash to lend, but people dont want it. indeed, outstanding debt is being reduced...so the money multiplier is not working..
As for the Bond for cash deal, the government issued a bond...and receives cash from the buyer.....government spends the cash, but the buyer now has a bond...this is as good as cash but earns interest, whereas cash doesnt. If the bank needs cash, it can either borrow using the bond as security, or sell the bond to another buyer, say your pension fund. The BoE /FED can also "buy" the bond...It can do so either from funds accumulated, or by creating cash out of thin air. the books still balance as the bank has issued x IOUS (liability) and now has the bond ( asset). The government now pays interest to the Bank. sure, but the point about bonds as money in this thread and the money illusion thread is mainly to explain past HPI, and why our public debt is not what it says on the tin. We'll get to the implications of this reality for future inflation and HPI in a bit, once we've all had a hcance to discuss the points presented so far. That means government bonds are almost as money-like as base money. if gov't bonds were really that much like base money, then there would be no point in the BoE creating hundreds of billions of pounds of base money (i.e. QE) to purchase gov't bonds! difficult to spend a £1,000,000 bearer bond in Sainsburys. you haven't been keeping up. to busy eyeing your palm no doubt. the monetisation of a bond simply recognises the fact the free market has already monetised it. havnig said that, you are right - there is no point to QE - it won't work. But it won't create hyperinflation either. the notion of lending money to an insitution that has the ability to print that money for itself is an absolute nonsense, and the market recognised that long ago. don't be a twit. a 1M bearer bond does nicely for buying companies, storing sovereign wealth and speculating in commodities. nope, it recognises that the gov't can't fund itself by its usual extortion methods (tax etc). and the free market has not 'already monetised' the debt, otherwise bonds would be priced exactly as legal tender, which they are obviously not (they generally trade at a discount - and they'd have much more of a discount right now if it weren't for QE). besides, legal tender laws prohibit the actual process of monetisation from being performed by anyone except the seignior (the BoE in sterling's case). there is a point in QE - it allows the gov't to 'technically' pay its bills that it would otherwise have had to default on by now. and what are you saying will not cause hyperinflation? 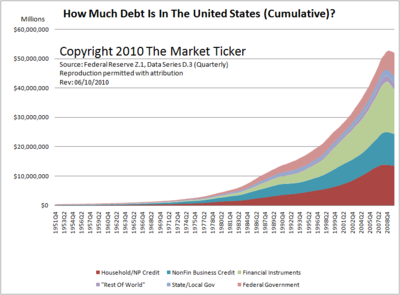 an ever increasing national debt that all ends up being monetised?